Currently our firm is working on a diverse range of projects from churches to car dealerships to banks. Welcome to our site - McLean Design Group - Terrill J. McLean, Architect - where quality design is our focus and client satisfaction is our goal. We continue to build our excellent reputation for client services by doing just that. You can depend on us for expertise, talent, and commitment to client satisfaction. During our 50-year history, we have managed a wide scope of projects which include, municipal, liturgical, medical facilities, fire stations, auto dealerships, and residential and industrial sites just to name a few. The bridge between the two modular buildings being completed. 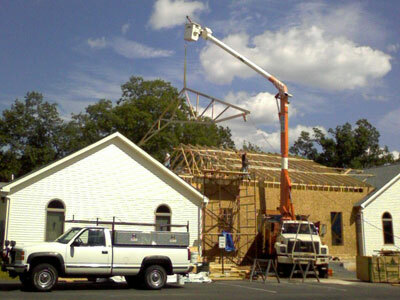 Read more and see how this church congregation will grow into a significant 17,000 sq. ft. "spiritual life" center serving Carbon County, PA.